With over 140 visitors throughout the day, all the exhibitors and people who kindly volunteered to help with refreshments were kept busy and much interest was shown in the wide variety of things on display. Many thanks to all who contributed to the event. 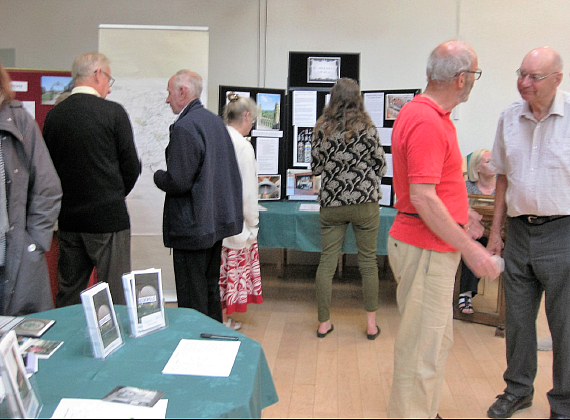 Exhibits included "Farming in the Old Days", "Husthwaite in WWI", "Shandy Hall", "Newburgh Priory", "Coxwold Railway Station", "Coxwold Pottery" and "St Michael's Church". Both villages had researched "Trades and Businesses" from times past and there was a good display of old postcards covering both villages, together with other memorabilia. Parish Records and chartered Family Histories were available for visitors to read and Husthwaite facilitated computer investigations of family ancestors. One nice comment came from Pete Hutchinson who came all the way from Welwyn Garden City - "We had a brilliant morning with so much to see and do and some very special friends to meet from quite a few decades ago. Gill, Jules and I enjoyed ourselves immensely and we were sorry we had to leave. The impressive materials/displays/publications are testament to a huge amount of work, enthusiasm, commitment and skill." Pete has offered to write some more articles about his memories of the village, to follow the one he wrote about Hutchinson Bros. Garage. images to come away with in my mind. I loved that one of the Dees family at Beacon Banks with the summerhouse in situ [remembered from her childhood]. I thought the exhibition had something for everyone and loved the idea of a quiz too." The response to requests for people to bring along sherds from their gardens or fields was excellent and attracted a number of people from other local villages. 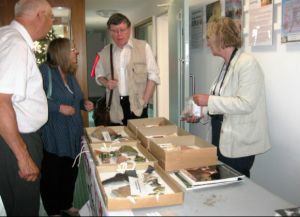 Roger Inman and Anne Jenner from the Yorkshire Archaeological Trust had a stall in the entrance to the hall, where they displayed Roman and later pottery, some of which was probably made in the Howardian Hills. They looked at the sherds that people brought in from their gardens and plotted the findspot on a large OS map. They were able to give a quick ID and spot date on the day, but took names and addresses so that a more detailed note can be sent to participants at a later date. The majority of the wares were green glazed Brandsby and Ryedale types, though they were happy to look at everything from green glazed to transfer printed wares. They say "we were thrilled to take over 20 contact details for those who are interested in helping with further work identifying local green glazed wares, and in particular Ryedale wares from the area, and thought the day was a great success and are very much looking forward to the next event". Due to popular request from both those who were not able to attend and from many who did not have time to view everything on display, a smaller exhibition from the Husthwaite team will be held in early autumn. Date to be announced.